Vincent and the impossible need for help: Dale Carnegie (1888-1955), the American writer, said, “Most important things in life have been accomplished by people who have kept on trying when there seemed to be no help at all”. I try to cling to this thought when things go bad or I feel intellectually and creatively abandoned. The most important people on this planet are Enquirers after Truth, and the function of the artist (along with ‘genius’ surely the most abused noun in the English language) is exactly that. It’s what, I’m convinced, Dale Carnegie was on about. As warned on 17th May, here is a bit more about ‘truth’, or at least my take on it. Despite the need to keep body, soul and family together, everything I’ve ever done – writing and teaching, natural history and science – has always been about that quest for truth; and it applies to the subjective matter of art as much, if not more, as anything else. I honestly think this is what has sustained me through difficult times. For example, during my doctorate – much of which saw me living in a camper van on the Welsh and Cornish cliffs – I used to promise myself a visit to the purpose-built Graham Sutherland Gallery at Picton Castle in Pembrokeshire. It was to here that he bequeathed his work (scandalously reneged on when it was all moved to Cardiff after his death, but that’s another matter). I used to drive past regularly; Fine Art promising as great a truth as the science I was doing. But does ‘fashion’ represent truth in any sense? Even though I’m fascinated by its trends, I don’t believe the important things which Mr Carnegie was on about include it. Jean Cocteau said, “Art produces ugly things, which frequently become beautiful with time, while fashion produces beautiful things which always become ugly with time”. So much so-called art is clever novelty; the fact that it is promoted by businessmen doesn’t alter that view. Another view is that craft alone produces good art; I don’t believe this is true either. It has its place of course (qv. Blog entry 7th Jan 2011, http://www.meyergallery.co.uk) but it is in practice a tool allowing the functioning of art. Too often, beautifully presented bad art masquerades as fine art because it fools the “imbecile” Cezanne spoke of last time (4th Jan 2014, if you haven’t read people’s interesting follow-up comments to this, they do repay it). Van Gogh was a hugely intelligent and intuitive artist, largely self-taught at a mature age. On my shelves, amongst several hundred books devoted to other artists and genres, I have 50 volumes devoted to him and have studied his work exhaustively, reading all six volumes of his massive correspondence. So, trying to draw on the rational bit of my brain, I find I differ from all the words written by others about his technique (not that many bother with that). It seems to me that most of van Gogh’s paintings and, more so, his drawings are shorthand – a means of getting a visual sensation down as quickly as possible. Not only from temporal necessity (eg. before conditions change) but also from impatience. I do know all about this! It is one consequence of a sense of mortality – something children, the naïve and the outsider don’t have. Vincent dealt with it in his own unique way. True, he was only in his 30s but, given his health and impecunity, he did not expect to live for long – always fearing his one true friend and supporter, his elder brother Theo, would abandon him. Reading his unedited letters, you realise that it was not always a happy relationship. I am nearly twice his age so have a great sense of mortality (let’s not beat about the bush) but I’ve always been driven and impatient. This is not cool, I know that, and frustration only ever an impulse away. Again, nothing to be proud of, but from anger comes energy; it is how you use this that is important. I admire the calm painstaking builder of crafty(?) images but just get cross with my own ineptitude – always eager to get down the next sensation – the next miracle that nature has contrived to lay out for the curious. Had it not been for Theo, we would never have heard of Vincent van Gogh; have no doubt, his stunning work would not exist. So perhaps Carnegie was both right and wrong: surely we all need at least one steadfast supporter. Vincent was a driven individual; maybe he would have been lucky and found someone else who was (relatively) rich, influential and supportive, or maybe he would have died in alcohol-fuelled bitter anonymous ignominy. Oh yes, we can relate to that too. But above all his drawing repays profound study, I mean the pencil>chalk>ink system he developed. And although his Arles period is considered by most to be his apogee, I have always related more to the following Saint-Remy asylum work. Here he was removed from worry and ambition. Gone was the impossible dream of his Studio of the South, the nightmare of his Paul Gauguin worship, and all the day-to-day cares, which are considerable if you are minus a life partner (and, um, even with one). Then Theo and Jo had a baby, and by the time he got to Auvers, under the quixotic care of Dr Gachet, Vincent was self-destructive, bored and worried beyond endurance. This the work reveals all too clearly. Originality was exhausted – burned out – and what any artist worthy of the name doesn’t do is repeat himself. Some Auvers work is unfinished – abandoned because the effort was too much – pointless and desperate, it no longer engaged or excited him. 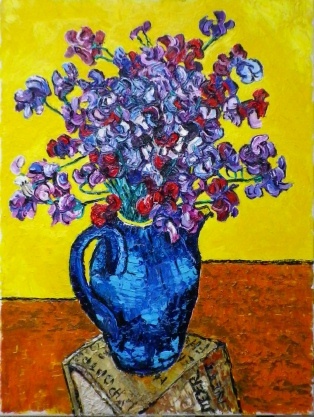 It seems I paint sweetpeas each year – they always engage me – but this year, as part of a series of still lifes I’m doing for The Plough Arts Centre in Devon, England, I did one partly as a homage to Vincent. It’s not in my gallery yet, so this is just a tiny preview. Even though, as usual, I paint with knives not brushes, I hope you can see something of what I’ve been prattling on about in it.